On October 23-25, 2009 I attended the AKC Canine Health Foundation 2009 National Parent Club Health Conference held in St. Louis, Missouri. This was the seventh conference which is held biannually and was sponsored by Nestlé Purina PetCare Company. The purpose of the conference is several-fold. It brings together many of the top researchers in the canine health field to bring the attendees up to speed on their AKC-CHF grant projects. It also allows the various parent club health representatives to catch their vision of the future – future diagnostic tests, future areas of research, and future therapies for canine health issues. On Friday there were several Round Table Discussions focusing on areas such as canine health surveys, the CHIC program, use of genetic tests, fundraising techniques and ideas, etc. We were privileged to have a number of veterinary students from across the country in attendance who received corporate and private scholarships to be there. They attended a special round table session held by the OFA (Orthopedic Foundation for Animals). On Saturday the key note speaker set the theme of this year’s conference as “One Health, One Medicine”. This reminded us that the health of humans and animals are intricately linked to each other. This was further reinforced by the next speaker Dr. Matthew Breen who spoke on “Canine Cancer and Comparative Genomics” and reminded us that there is an 80- 90% homology between the human and canine genome. Practically speaking this means research in human diseases will benefit dogs and conversely, research in canine disease will directly benefit human medicine. He also showed how the work on the Canine Genome Project which was completed in 2005 has exponentially increased the advancement of research in genetic disease and the advancement in technology to facilitate this research. In the afternoon there were presentations on new diagnostic and therapeutic investigations in canine neurologic disease and advances in canine cardiac research. The conference finished up Sunday morning with a presentation on the genetic basis of urate bladder stones in Dalmatians and how this research has helped in two other breeds prone to urate stones – the Bulldog and the Black Russian Terrier. In between sessions there were some good meals, entertainment and fellowship with other breed health chairs. The Chinese Shar-Pei is not alone in having genetically-based disease problems. While the CSPCA Charitable Trust often funds canine health research in areas that do not specifically focus on our breed this research does help other breeds and also people. Many of the cancer research projects we helped sponsor have helped the Shar-Pei as demonstrated by the release of Palladia® for canine mast cell cancer. We are a part of the canine community and we need to help and support each other. We are fortunate to have many dedicated scientists, laboratory workers, doctors, universities, research centers, corporations, dog breed clubs, dog owners and many other benefactors to help us in our goal of having healthier dogs. Our money is not wasted. The AKC Canine Health Foundation is very selective in its grant funding and solicits the very best researchers. The CHF requires periodic feedback on the projects it funds to determine if the grant money is being used in the best possible way. Recently West Suburban Veterinary Associates purchased a Class IV therapeutic laser to enhance the medical care of our client’s pets. Due to advancements in veterinary medicine and surgery over the last several decades our pets are living longer and experiencing more issues related to degenerative joint disease (arthritis) and physical rehabilitation issues following orthopedic joint surgery . There also is a more recent increase in dogs entering performance events such as agility, free-style dancing, obedience, rally, flyball and service dogs participating in search and rescue, police work, military dogs , etc. When these dogs experience injuries they often return to function quicker with physical rehabilitation equipment and techniques taken from the human side. Class I and Class II lasers are low power lasers used in CD players, DVD players, laser printers and bar code readers. Class IV lasers are surgical lasers (cutting) and higher power therapy lasers (lasers >0.5 Watts up to 10Watts). The therapeutic laser is NOT a surgical laser and CANNOT cut a patient. The Class IV therapeutic laser has a maximum power of 10Watts which can penetrate several inches into the muscle and joints as opposed to Class III therapeutic lasers with the highest power capability of 0.5Watts which can only penetrate in millimeters. The Class IV therapeutic laser delivery system is a quartz fiber hand-held device. LED (Class III) phototherapy should not be confused with laser therapy. When laser light is directed at tissue it is reflected, scattered, absorbed or transmitted. The absorption of laser light is the key therapeutic goal. Wavelength and tissue composition is critical to defining the depth of tissue penetration. Absorption is wavelength dependant with longer wavelengths being absorbed less by superficial tissues and penetrating deeper. The Class IV therapeutic laser has a wavelength of 980nm which penetrates more deeply into tissue. When laser light penetrates tissue there are a number of mechanisms of action. All involve photochemical interactions of photons with the tissue. The laser light changes biochemistry by a process called photobiomoduation or photobiostimulation. This process consists of tissue mechanisms of action and cellular mechanisms of action. The laser light creates electrical, temperature and pressure gradients in the tissue. These gradients impact electrolyte movement and transport of cellular nutrients and wastes across cell membranes. Ordinary light cannot do this. The cellular mechanism of action of Class IV therapy lasers is dependent on photon absorption by tissue chromophores. Tissue chromophores are components of cellular and sub-cellular organelles which absorb light. Chromophobes located in mitochondria (cellular “batteries”) absorb photons from the laser light. The absorbed energy stimulates the energy-producing chemical reactions in the cell and increase the synthesis of DNA and RNA. Essentially the cells are “turned on” with increased metabolic activity. The clinical changes noted after use of the Class IV laser therapy include reduced pain, reduced inflammation and accelerating healing. These changes are a result of a combination of biological and biochemical effects. Increased angiogenesis and capillary formation. Faster wound healing due to stimulation of fibroblasts with resultant increase in collagen production. Soft tissue injuries such as hematomas, swelling, edema, inflammation, etc. There are some safety issues in the performance of laser therapy. These center around possible eye damage and heating of tissues. The owner and the operator wear required eye glasses to prevent damage to the eyes caused by reflection of the laser light. This reflection is minimal with the Class IV therapeutic laser. Animals may also have to be restrained so they can’t look at the light or wear protective eye wear such as goggles or a blind fold. Over-heating of the tissues is prevented by controlling the laser head properly, constantly moving the laser probe and using your hand to evaluate temperature of the skin. 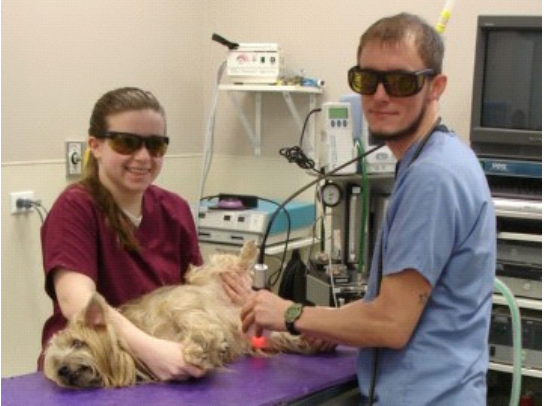 Our veterinary technicians have received training in performing Class IV therapeutic laser treatment and have the necessary protective eye wear and skills. Please don’t hesitate to ask any of the staff about the uses and benefits of Class IV therapeutic laser therapy. We are very excited about offering this service to our clients and their pets. Please don’t hesitate to ask any of the staff about the uses and benefits of Class IV therapeutic laser therapy. We are very excited about offering this service to our clients and their pets. Be sure to specifically check that the company you are inquiring about insures the Chinese SharPei breed. Ask specific questions about claims concerning entropion repair, cherry eye surgery, Familial Shar-Pei Fever, Streptococcal Toxic Shock Syndrome, hernias and other conditions they may consider “pre-existing”, “hereditary”, “breed-specific” or “congenital”. Some companies may not cover some conditions so ask about the exclusions. GET EVERYTHING IN WRITING! This would include notes on phone conversations, deductibles, claim handling, answers to your questions, etc. Save everything as well.